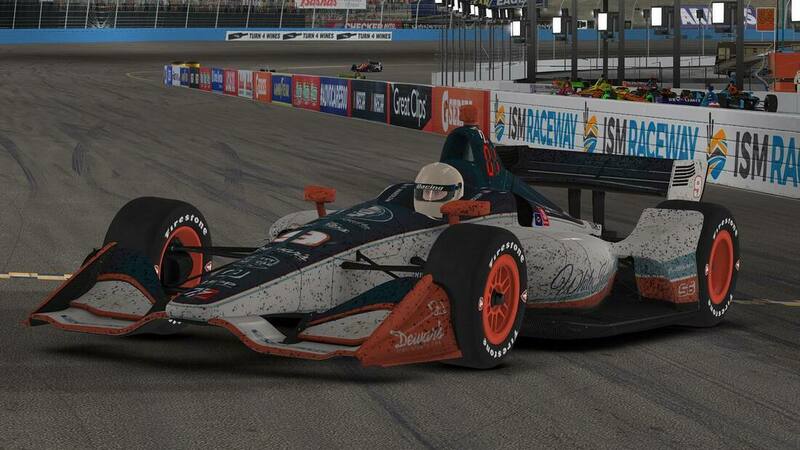 After a tough race last time out at ISM, things don’t get any less “tricky” for the Lionheart IndyCar Series drivers as they get back into action this week for the first of the triple crown races, IracingIflag Pocono 300 Presented by Fat Dog Racing. Nicknamed the “tricky triangle” the famous raceway in Long Pond Pennsylvania features 3 unique corners that each present a different challenge to the drivers. Turn 1, clocking at 14 degrees of banking, is modeled after turns 3 and 4 of the now defunct Trenton Speedway. Turn 2, also known as the tunnel turn, has 9 degrees of banking and is modeled after the famous Indianapolis Motor Speedway. Unlike Indy, the tunnel to access the infield of the track runs under this turn, creating the signature hump in the middle of the corner that has caught many a driver out over the years. Finally turn 3 is the flattest of the 3 (yes, 3) corners on the track, and is modelled after the Milwaukee Mile. With 3 corners as distinctive as these, it is often very difficult to make the car work in all 3 corners, and engineers are often forced to settle for 2 corners. Normally either turn 1 or 3 are sacrificed, as turn 2 is often taken flat out. This unique race track is the first jewel in the Lionheart Triple Crown. Last week at ISM, it was Dustin Wardlow working the pit strategy and the fuel to perfection, running out of fuel as he crossed the line for his first win of 2019. In fact, in 4 races, we have had 4 different drivers in Victory Lane. Dan Geren, Scotty Johnson and Sage Karam being the other 3. Karam took 2nd place at ISM to move up to 5th in the championship, while Adam Blocker, Andrew Kinsella and Chris Stofer swept the bottom of the top 5. The win has vaulted “the Candy Man” into 2nd place in the championship. Dewar’s candy has seemed to given Wardlow an extra boost this season, although word on the street is his car passed tech inspection after the ISM race, so we know the candy is not going into the fuel tank! At the top of the drivers standings is Adam Blocker. While Blocker has yet to win this season, the South Carolina driver has also yet to finish off the podium through 4 races. Your defending series champion, Blocker is showing the type of consistency and prowess that will make him extremely hard to catch if this form holds. In case you were thinking of betting against the points leader, Blocker finished 2nd here last season to his teammate Andrew Kinsella. Speaking of Kinsella, the Canadian has had an uncharacteristically quiet start to the season. Yes he has 3 top 5’s through 4 races, but no podiums and no wins mean a much slower started compared to last year, where he had 3 wins through the first 5 races. The last of those, coming at this very race track, was the last win for Kinsella in the Lionheart series, meaning a full calendar year has gone by since the Canadian won a race. With Blocker, Wardlow, Karam and Geran all winning in the interim, you can bet this will be one hungry Canadian on Wednesday. He will have one major hurdle to overcome however…Now in Season 7, there are still no two-time Pocono winners ever in Lionheart history. Will Kinsella be able to turn that tide this season? Dan Geren is coming of an uncharacteristically quiet night at ISM where he finished just 23rd. The Midwest driver has still had a good start to the year, however, after his win in the opener at Homestead and is sitting 3rd in the championship battle. Geren is famous in the Lionheart series for his blistering pole runs; in fact, he sits tied with Jake Wright for all time Pole Positions in Lionheart History at 26. The next time Dan Geren secures a Pole he will become the all-time leader in most Pole Positions. To give you an idea as to just how dominant these 2 have been Jesse Vincent sits in 3rd with 9. That being said, this writer, despite the tie, will still give the tip of his cap to Geren as the greatest qualifier in Lionheart history. Why? Because Wright, while fast on ovals, collected the majority of his poles on road courses, where the gaps tend to be bigger. Geren does have on reason NOT to go for pole position, however, that is that the pole sitter has never won the race at Pocono in Lionheart History. If Geren is looking to win on Wednesday, he may better to wait until Belle Isle to go for a pole run. This brings us to the track. As mentioned above, Pocono is unique circuit, but it is also a big one. 2.5 miles to be exact, and Lionhearts adoption of the dynamic skyboxes iRacing implemented last year has turned the track into and adventure. The track temperatures are fluctuating as the track entering and exiting the cloud cover, with temperatures in practice from the 80’s through temps into 110’s. Due to the size of the track, some corners may be shaded while others aren’t leading to temperature changes corner to corner. The hotter temps are creating more understeer which is making passing difficult. With an anticipated in-sim start time of approximately 12:40 local time, the track is also anticipated to cool down over the course of the afternoon. Look for the drivers to make their moves as the track cools off. All the action from the IracingIflag Pocono 300 Presented by Fat Dog Racing can be seen live Wednesday 24th at 10:35 pm Eastern only on the iRacing eSports Network presented by GSRC.